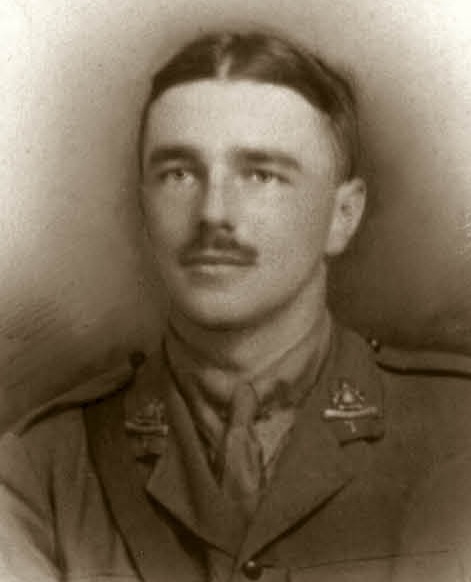 The Wilfred Owen archive has just been fully rehoused and catalogued, with a detailed list of items available online. The collection has had a lively existence thus far, with the bulk of it donated by Harold Owen in 1975 to the English Faculty Library. Wilfred’s cousin Leslie Gunston donated the Gunston collection in 1978. Small additions have been made since then, and the collection now includes the working papers and correspondence of two prominent Owen scholars, Dominic Hibberd and Jon Stallworthy. The entire collection was transferred to the Weston Library on 13 January 2016. Following a month of work, the collection has been reordered and renumbered, although the former, widely-cited OEF (Oxford English Faculty) references are included in the catalogue, as are references to Jon Stallworthy’s transcripts in Wilfred Owen: The Complete Poems and Fragments (CPF). Wilfred Owen’s literary papers make up the first six boxes (MSS. 12282/1-6) and include Wilfred’s original manuscripts (digital versions of which are available on the Word War I Poetry Digital Archive), allowing the reader to see the maturation of Owen’s poetry from the early ‘To Poesy’ to his masterpieces ‘Dulce et Decorum Est’, ‘Mental Cases’ and ‘Anthem for Dead Youth’. Drafts of poems that Wilfred sent to his cousin, Leslie Gunston, are also found in this part of the collection. The archive also contains other primary source material relating to Wilfred. At MSS. 12282/34-5 there are original editions of The Hydra, a magazine published by the patients at Craiglockhart Hospital for Neurasthenic Officers where Wilfred was a patient in 1917. He edited several issues of the magazine and some of the copies have annotations by him, such as ‘With the Editor’s Compliments!’ School exercise books and correspondence are similarly preserved, and there is an extensive collection of objects and family possessions relating to Wilfred and his family. Many of the objects are extremely fragile and kept in a Reserved part of the collection, but they provide a tangible closeness to Wilfred. Found here are some of Tom Owen’s souvenirs from India, Susan Owen’s jewellery box, with locks of Wilfred’s baby hair, an old family clock, a boat handmade by Tom for Wilfred, and some binoculars belonging to Wilfred himself. The photographs in the archive span from the late 19th century to the late 20th century, and include many generations of Wilfred’s mother’s family. The photos are arranged by size and subject and include photographs of Wilfred. 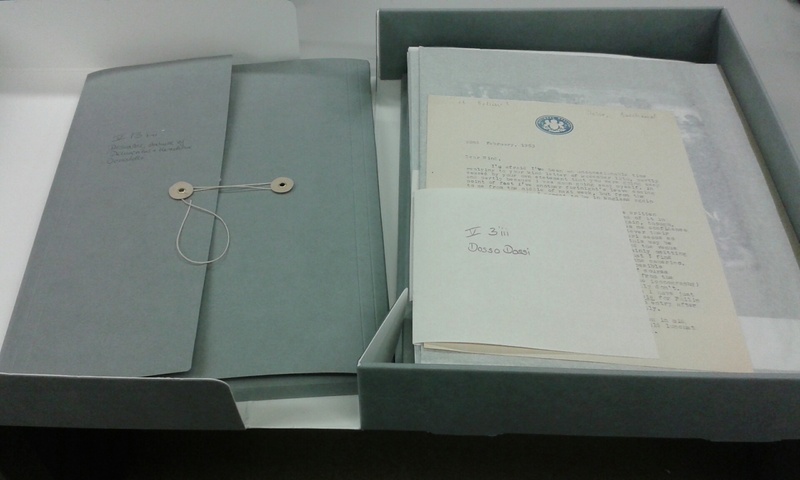 The remainder of the archive mostly consists of Harold Owen’s correspondence, press cuttings and working papers. These offer a fascinating insight into the life of Wilfred’s brother, Harold and highlight the way in which he controlled Wilfred’s reputation and that of the Owen family. His correspondence with admirers, scholars, publishers, libraries and museums uncovers the human face of archival acquisitions and posthumous literary fame. Harold’s biography, Journey from Obscurity, is found in this part of the collection, with a first draft of almost 1000 pages written by hand in Harold’s characteristic small capitals. There are three later additions to the archive. The 1978 Gunston donation includes manuscripts dating back to the 19th century, letters, photographs and cartoons. Particularly charming are Leslie’s letters to his wife Norah, and the sketches contained in them. The Owen scholar Dominic Hibberd gave his working files, which contain correspondence, press cuttings, photocopies and photographs, generated in the course of his research. Some of these items are dated as recently as 2002, and include new resources, such as photocopies of the birth, death and marriage certificates of Wilfred’s extended family. Also present are Jon Stallworthy’s working files, which are comprised mostly of photocopies of the Owen manuscripts which he used to create his Complete Poems and Fragments. Items 83 and 102 in MS. 12282/7, folder 2 are two letters from Annie G Phillips to Harold Owen, dated November 1969. Annie is studying for her A levels, and writes to Harold of her admiration for Journey from Obscurity, his memoirs. She says that learning about the family life of the Owens has helped her understand Wilfred’s poetry on a deeper level, but she also makes some very personal connections. Like Wilfred, she cannot afford to go to university. Harold’s reply must have been kind because her follow-up letter is even more brimming with excitement. These exchanges really posit Harold as a living connection to Wilfred, a way for readers to access the poet, a way of keeping Wilfred alive. But this is of course exactly what Harold’s archival work did and does. His own papers are testimony to that process of preservation, and exist as items worthy of study in their own right. But these letters also left me wondering what happened to Annie Phillips, who must now be nearing 80. Did she ever go to university? Is she still reading Wilfred Owen? Item 151 in MS. 12282 photogr. 3 is a postcard of Scarborough during the war, collected as part of a group of postcards of places connected to Wilfred Owen. It follows postcards of Bordeaux, Ripon, Ors, and many other places. The photographed place is the focus of these postcards, and very few have any writing on them. But item 151 dates from the First World War and has a message written to a ‘Miss Lucy Sunderland’ from ‘Daddy’. Archival work is never neutral, and the decision made to use this postcard in the collection represents a value judgement: the photographic record of a place is of greater importance than the message contained on the verso of the card. 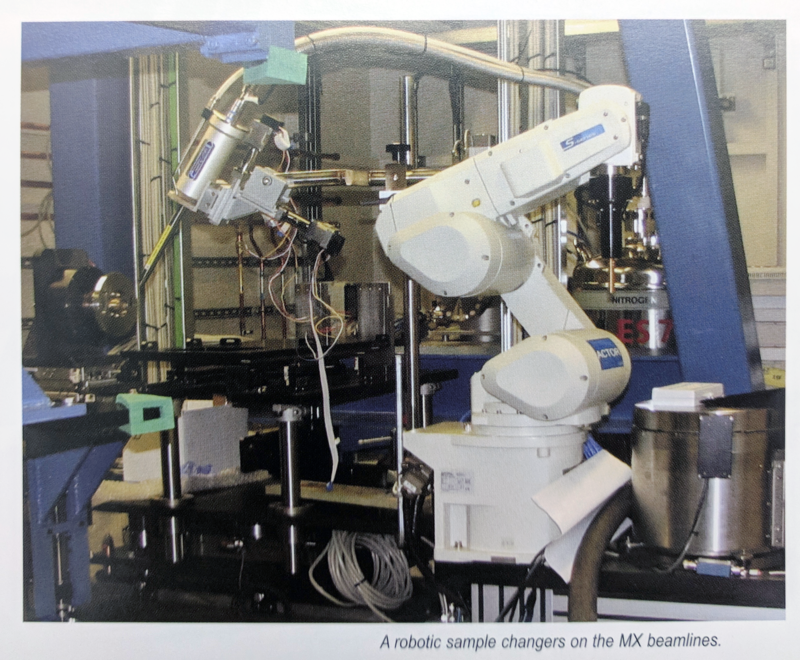 In the catalogue, I decided to include the information about the scribbled message in an attempt to balance out the conflicting demands placed upon this item. We’ll never know if Lucy’s Daddy made it back home again. Item 16 in MS. 12282 objects 2 is a tiny cardboard box inside Susan Owen’s jewellery box. This tiny box contains two envelopes with the hair of Wilfred Owen inside. One of the locks of hair even had the shedded skin of a carpet beetle lodged within it! The hair itself was one of the most moving discoveries within the collection, with a tangibility that is both enticing and repulsive. But the manner of preservation was fascinating, too. The hair had originally been labelled in the envelopes and box by someone with a cursive hand, most likely Susan Owen herself, who would have been the one to cut Wilfred’s hair. The pencil marks had somewhat faded away, but one of the envelopes read ‘The hair of Sir Wilfred Edward Salter-Owen at the age of 11 ½ months in the year 1894’ For Susan, then, this was the act of a proud mother, keeping a memory of her son’s early years, to look back upon when he was older. But the cursive pencil writing is overshadowed by the characteristic small capitals in ink of Harold Owen. Harold labels the box as ‘The poet Wilfred Owen’s hair’. He displays an entirely different motive – to preserve the remains of a well-known literary figure. The object’s purpose and identity has been altered by the motives of its various owners. How the Bodleian labels this item will necessarily be another act of alteration. A strand of hair is never just a strand of hair! 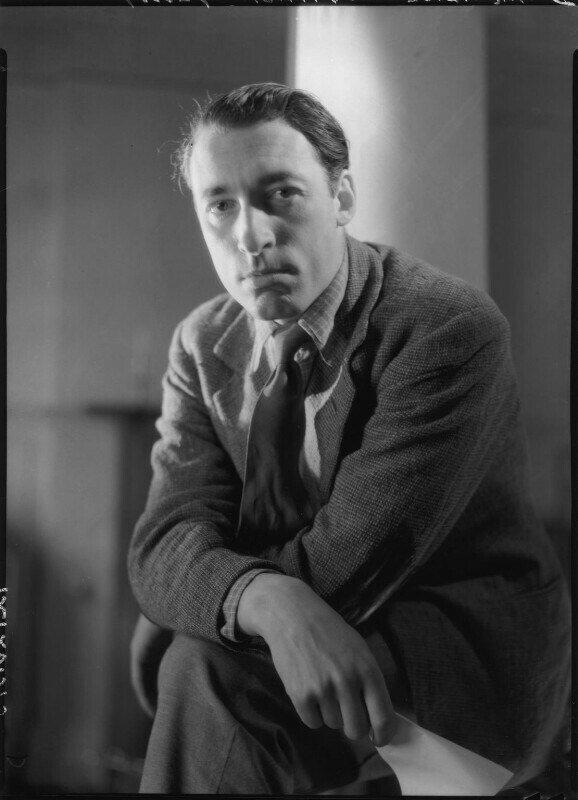 The catalogue of the papers of the Northern Irish poet and playwright Louis MacNeice (1907-1963) is now available online. MacNeice studied Classics at Oxford from 1926, and together with Stephen Spender and Cecil Day-Lewis, he became part of the circle of poets and writer that had formed around W.H. Auden. 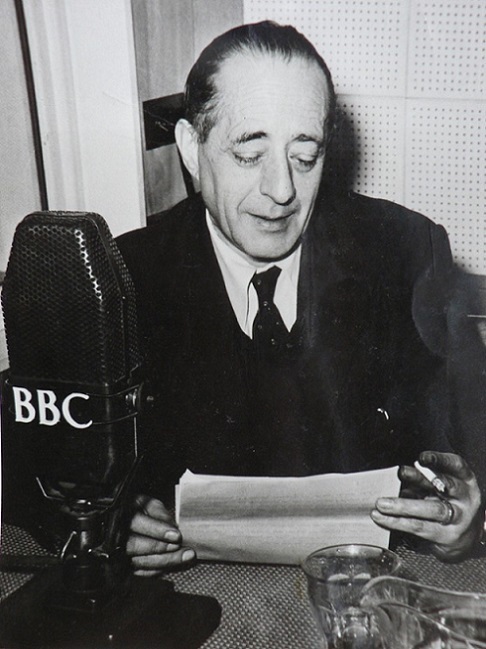 His professional life began in 1930 as a lecturer in Classics, but in 1941 he joined the BBC and for the next twenty years produced radio plays and other programmes for the Features Department. Whilst he also wrote articles and reviews, theatre plays, a novel and even a children’s book, MacNeice is best known for his poetry. Between 1929 and 1963, he published more than a dozen poetry volumes, such as Autumn Journal (1939) – regarded by many as his masterpiece, Springboard (1944), Holes in the Sky (1948), Ten Burnt Offerings (1952), and Visitations (1957). His last poetry volume, The Burning Perch came out just a few days after MacNeice’s untimely death in autumn 1963. Amongst other works published posthumously were a book entitled Astrology (1964), Selected Poems (1964) edited by W.H. Auden, the autobiography The Strings are False (1965) edited by E.R. Dodds, and Varieties of Parable (1965), as well as the radio/ theatre plays The Mad Islands and The Administrator (1964), One for the Grave (1968) and Persons from Porlock (1969), and the song cycle The Revenant (1975). nitrate negative, 1942. NPG x1624. Speaking notes prepared for Margaret Thatcher, annotated drafts of William Hague’s election leaflets, and briefing papers written by David Cameron as a young researcher are all among files newly-released by the Conservative Party Archive for 2019. This year, our releases are drawn primarily from the records of the Conservative Research Department (CRD): these comprise the department’s subject files and working papers, its briefings prepared for Members of Parliament, and the papers and correspondence of CRD desk officers. 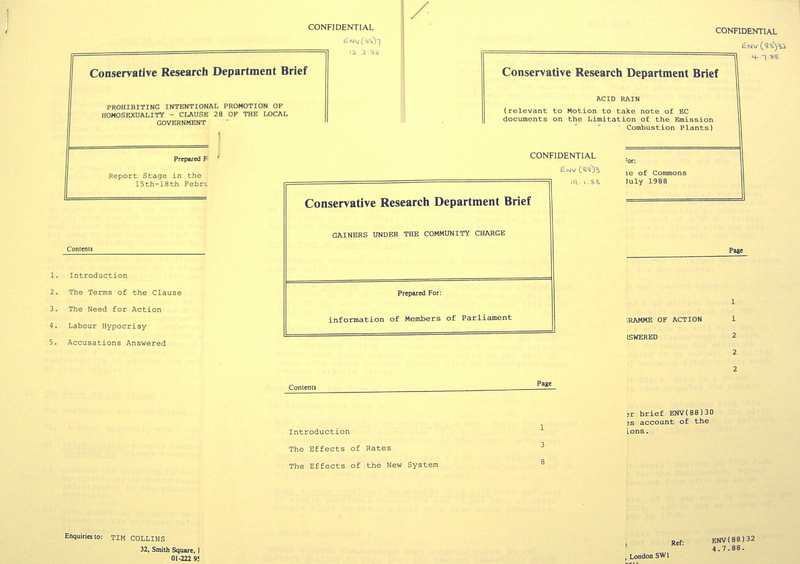 In addition to our regular scheduled de-restrictions, the Conservative Party Archive is pleased to announce that the papers of Robin Harris, the Director of the Conservative Research Department from 1985-1989, will also be made available for consultation for the first time. This blog will briefly look at some of the items to be found in each of these main series, demonstrating the value of these collections to researchers of the Conservative Party and historians of modern British history. Among the newly-released records are a number of files on the ever-thorny question of Europe, including the minutes and papers of the European Steering Committee, the Party’s coordinating group for the 1989 elections to the European Parliament. 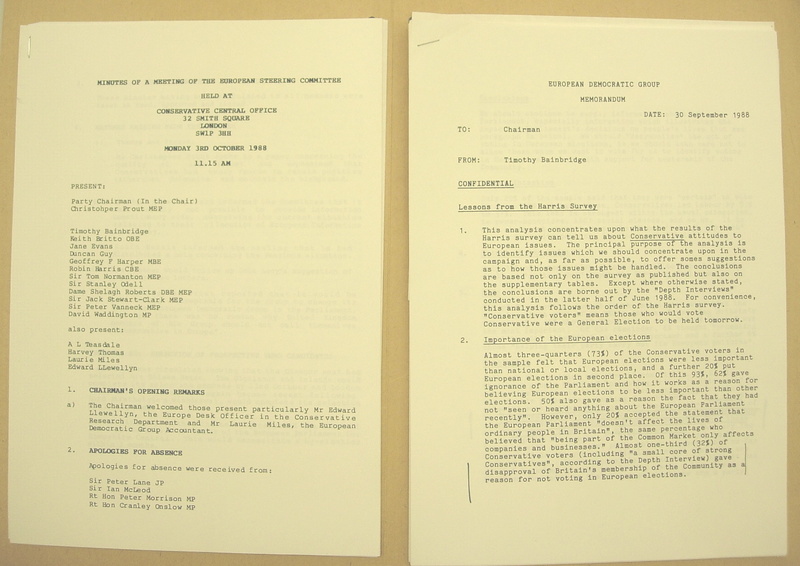 These files provide a fascinating insight into the challenges the Party faced in trying to balance the record of its MEPs with the increasing Euroscepticism of British Conservatism: a September 1988 report on the Party’s private polling on Europe, for instance, warned that nearly a third of Conservative general election voters were opposed to EEC membership and would not turn out to support the Party in the European Elections [CPA CRD 4/30/3/1]. The Conservative Party Archive has, separately, also recently acquired the records of the Conservative delegation to the European Parliament in this period, and will be seeking to make these available for consultation later in 2019. Minutes and papers of the European Steering Committee – CPA CRD 4/30/3/1. This year’s releases under the thirty-year rule include a wide range of policy briefings prepared by the Research Department. These briefings, typically prepared for Conservative MPs and Peers ahead of parliamentary debates, provide an excellent snapshot of the Party’s thinking, tactics, and rhetorical strategy on the key issues of the day. Subjects covered by the briefings include some of the most prominent policies of the Thatcher government, including the introduction of the Community Charge (Poll Tax) and the privatisation of state-owned utilities. A selection of CRD briefings from the Environment and Local Government file, covering the Community Charge, Section 28, and Acid Rain – CPA CRD/B/11/7. 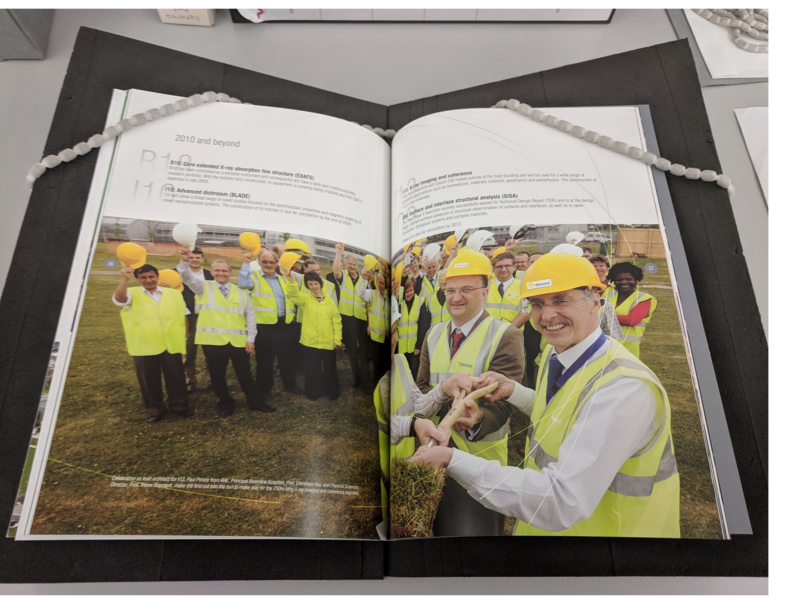 This series notably includes briefing papers prepared by David Cameron during his time in CRD, covering topics on environmental, energy and industrial policy. In 1989 Cameron became the Head of the Political Section, a post he held in the department until 1992, and we expect to be able to de-restrict more of his papers from this period in the years ahead. Two CRD briefings on Energy Privatisation written by David Cameron – CPA CRD/B/10/8. The papers and letter books of the Research Department desk officers are a unique resource for those studying the history of Conservatism. Among those files newly de-restricted for 2019 are the letter books of CRD Desk Officer Richard Marsh. Specialising in environmental policy and local government, Marsh’s papers include extensive material on the Poll Tax, and are likely to be of high value to researchers of the subject. Marsh’s papers also include a draft copy of William Hague’s election leaflet from the 1989 by-election, complete with revealing annotations – a pledge to bring in harsher sentences for criminals, for instance, is struck out and replaced with a vaguer commitment to take ‘vigorous action in the fight against crime’ [CPA CRD/L/4/40/2]. 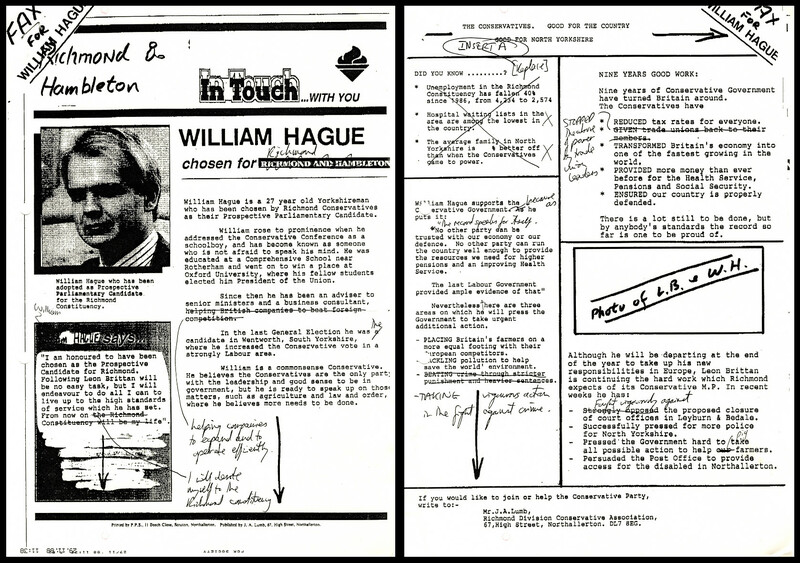 Annotated drafts of an election leaflet for William Hague, the Party’s candidate in the 1989 Richmond By-election – CPA CRD/L/4/40/2. Finally, the records of CRD Director Robin Harris provide a rich insight into the Conservative Party during the 1980s. 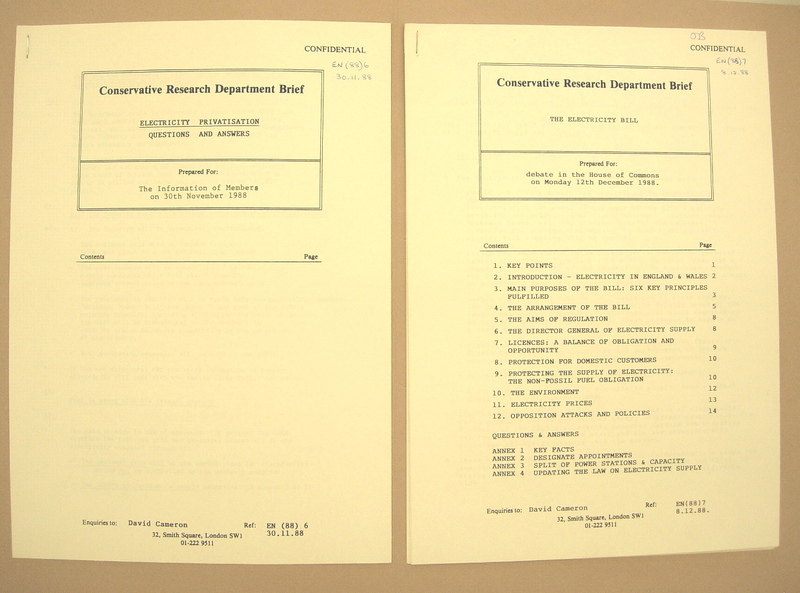 For instance, Harris’ letter book for August and September 1987 shows how the Research Department went about preparing material for Thatcher’s speech to the Conservative Party Conference, with draft sections of the speech and working memoranda included in the file [CRD/D/10/2/25]. Robin Harris file on Margaret Thatcher’s 1987 Party Conference speech, including draft speech sections – CPA CRD/D/10/2/25. 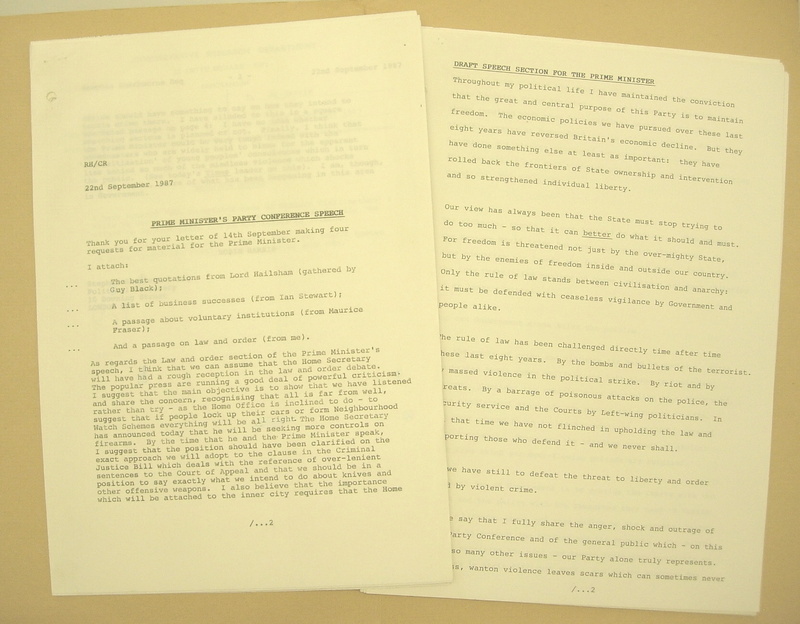 Harris’ papers also show how the Party responded at times of political crisis. 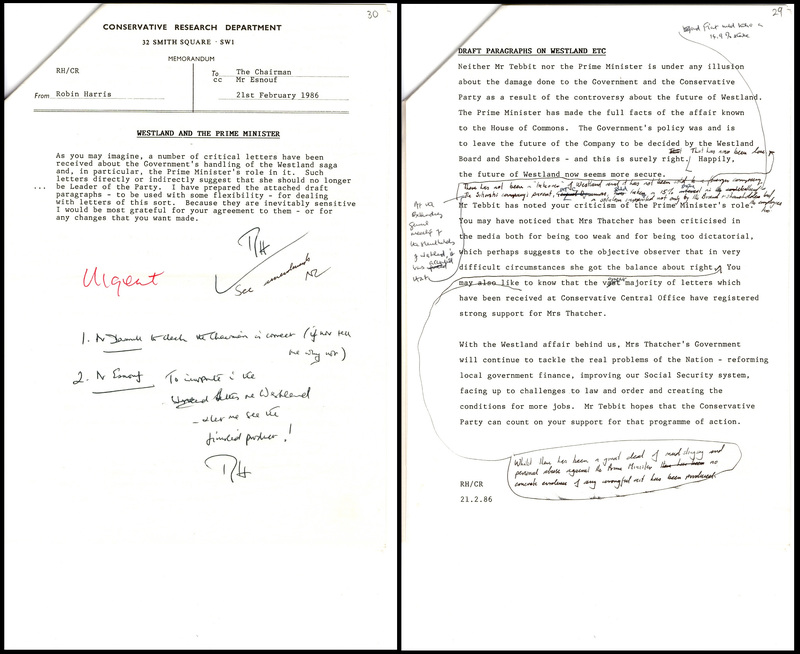 During the Westland Affair, when Thatcher’s premiership was briefly seen to be threatened, the Party received numerous letters from the public calling on the Prime Minister to resign. Harris’ memo books from the time show how Conservative Central Office managed the situation, drafting template responses defending the government’s conduct [CRD/D/10/1/11]. The papers should prove to be a valuable resource for historians of the period, and we expect to be able to make further de-restrictions in this series under the thirty-year rule in January 2020. Robin Harris memoranda on the Party’s response to the Westland Affair – CPA CRD/D/10/1/11. All the material featured in this blog post will be made available from 1 Jan 2019. The full list of de-restricted items will be published shortly on the CPA website, where de-restriction lists from previous years are also available. The online catalogue of Shrimpton’s Oxford Caricatures is now available. Thomas Shrimpton & Son published and sold photographic reproductions of commissioned or submitted original caricatures from their premises at 23-4 Broad St., Oxford, from 1868-1901, their shop window display seemingly their only advertising strategy, there being no evidence of them ever having produced a catalogue or list. 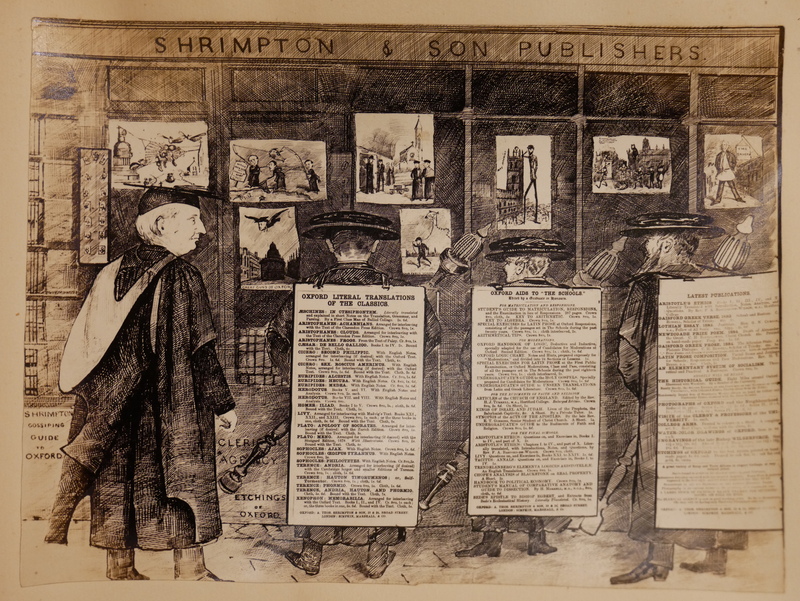 Shrimpton & Sons shop window, with Benjamin Jowett, Vice-Chancellor and Master of Balliol College and three beadles as sandwich men advertising publications for sale, 1884. 8 recognisable caricatures are on display and are held within collection. G. A. Oxon. 4º 417, fol. 1050. The caricatures were primarily intended for undergraduates and drawn by undergraduates, portraying the trials and tribulations of undergraduate life, as well as the delights, as seen from their perspective. Images are immediate and inventive, and often quite irreverent. Certain individuals received special and frequent attention, their identification, despite (thinly) disguised attempts to conceal their names through clever or simplistic wordplay, were only too obvious to University members. Many caricatures lack a proper caption or title, relying solely upon a pithy phrase, quotation or misquotation to assist the viewer. Some allusions are obscure or meaningless at first sight, but with thought and research their message or humorous allusion has been revealed. The subject matter includes many aspects of University life, notably University and religious personalities. Other subjects frequently covered are ritualism, politics, aestheticism , ‘town and gown’ confrontations and women, especially allusions to their becoming full members of the University. The imagery is invariably humorous, witty and inventive, covering local (University), as well as, national events; many display learned quotations from classical authors and contemporary poets. Throughout the publishing history distinct series were produced, notably ‘Great Guns of Oxford’ (Nos. 1 – ) and’ Our Public Schools’ (Nos.1-27), generally representing an individual in their familiar setting, though always done humorously. In all there are 1214 images. The 7 albums which comprise the collection would appear to represent the complete set of caricatures published. This set, together with the one in the John Johnson Collection, are the only known ‘complete sets’. I have made every attempt to identify individuals (500+), including caricaturists, locations and events in order to produce a fully comprehensive catalogue. Where appropriate, contextual notes have been added and quotations cited. The locations of the (few known) surviving, original caricatures are provided within the catalogue description. The heyday of the publishing history of the ‘Caricatures’ in terms of output and inventiveness was 1868-84, after which new publications became increasingly erratic. There was probably a combination of reasons for this, but its long demise may well have started in earnest when Thomas Shrimpton died in 1885 aged 79. Perhaps its commercial potential was already waning. Even so they had become an Oxford institution, known by all at the University at the time and remembered fondly by many for years to come. The importance of these caricatures is not only the number of individuals represented (some of whom may have no existing likeness elsewhere), but also the context in which they appear, alluding to events which would, perhaps, be otherwise completely forgotten. Until now their full extent could not be fully appreciated. Now, for the first time, this wonderful, visual resource for the study of various aspects of Oxford University life in the second half of the nineteenth century, has been fully catalogued. A hundred years ago, at 11 a.m. on 11 November 1918 (the eleventh hour of the eleventh day of the eleventh month) the Armistice was signed, bringing to an end the First World War. As the celebratory church bells rang out, a telegram was delivered to Susan and Tom Owen informing them of the death of their eldest son, Wilfred, one of 17 million casualties of the Great War to end all wars. He had been killed at the age of 25, just seven days before the Armistice. Owen received the Military Cross for gallantry, but was unknown to the public as a poet: only five of his poems were in print before his death. Today he is recognised as one of the greatest writers of war poetry in the English language. To mark this double centenary the Bodleian has mounted a display of original material from the Owen Collection, which was given to Oxford University by Owen’s sister-in-law, Phyllis, in 1975 and transferred from the English Faculty Library to the Bodleian in 2016. Included in the exhibition are manuscripts of ‘Dulce et Decorum Est’ and ‘Anthem for Doomed Youth’; editions of the Craiglockhart Hospital magazine which Owen edited while being treated for shell-shock in 1917, and a selection of photographs and personal belongings preserved by his family. Photograph of Clement Attlee, n.d. [MS. CRA. 99]. Join the Attlee Foundation and Bodleian Libraries on the 25th of October in the Weston Lecture Theatre to celebrate the life and legacy of Clement Attlee. The event will commence with a lecture given by John Bew on the political thought of Clement Attlee. A Professor of History and Foreign Policy at the War Studies Department at King’s College London, John Bew is also the author of five books including the award-winning biography Citizen Clem: A Life of Attlee (2016), which received the Orwell Prize for Political Writing, the Elizabeth Longford Prize for Historical Biography and the Best Book in the U.K.
A list by Clement Attlee of his “best appointments”, n.d. [post 1951] [MS. CRA. 10]. The lecture will be accompanied by a display of items from Clement Attlee’s personal archive. Covering the years 1945-1951, the display offers viewers a unique insight into the life and work of Attlee, forming a celebration of his achievements in both personal, political and public arenas. This event is free but places are limited so please complete the booking form via our website to reserve tickets in advance. All bookings are subject to a £1 booking fee. Doors open at 6.15pm. The lecture begins at 6.30pm, and will be followed by a drinks reception. Arturo and Ilsa Barea’s archive and library have been kept in a terrace house near Finsbury Park for the past 40 years. 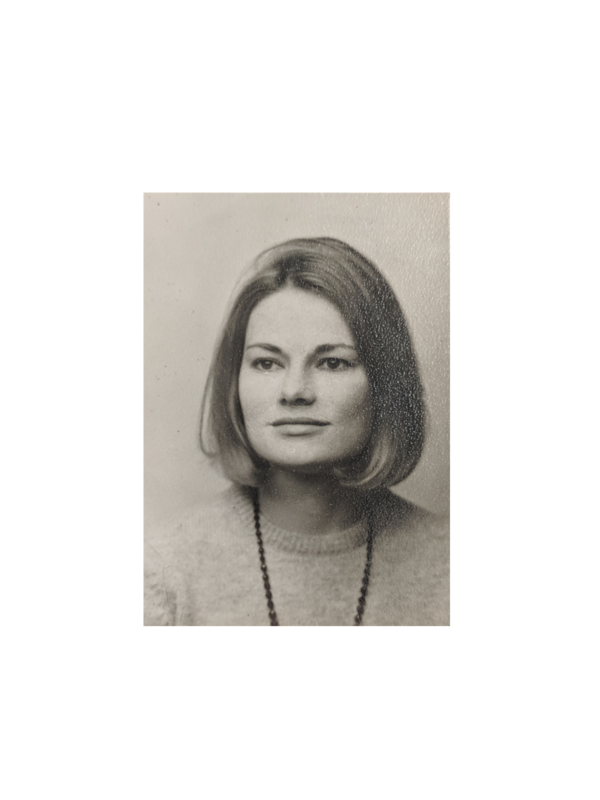 Their niece Uli Rushby-Smith inherited this large collection in the 1970s and has taken upon herself the daunting task of looking after the estate and ensuring that the Bareas’ legacies are kept alive by promoting several new editions of their work. It was through Arturo Barea’s biographer Michael Eaude that I came into contact with Uli, the terrace house, the papers and the books in 2011. I was interested in writing a PhD thesis on Arturo Barea and having access to the archive was a wonderful oportunity. Aside from researching for my thesis ‘A Spaniard in Hertfordshire: The Intellectual Exile of Arturo Barea’, I catalogued the papers and, in the process, became personally involved in this wonderful story. 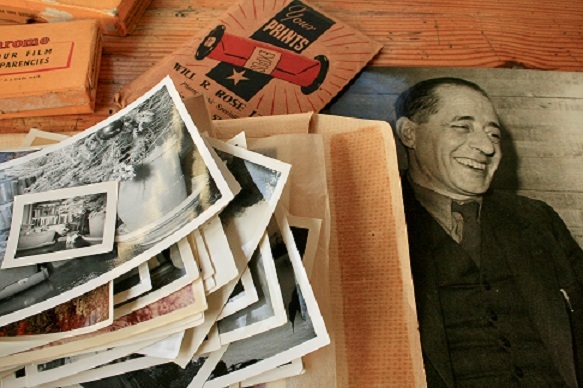 When I first arrived, about twenty boxes of articles, letters, drafts, newspaper cuttings and scrapbooks belonging to Arturo and Ilsa, and several walls covered with the books of five generations (from Ilsa’s parents to her great nieces) were awaiting me. 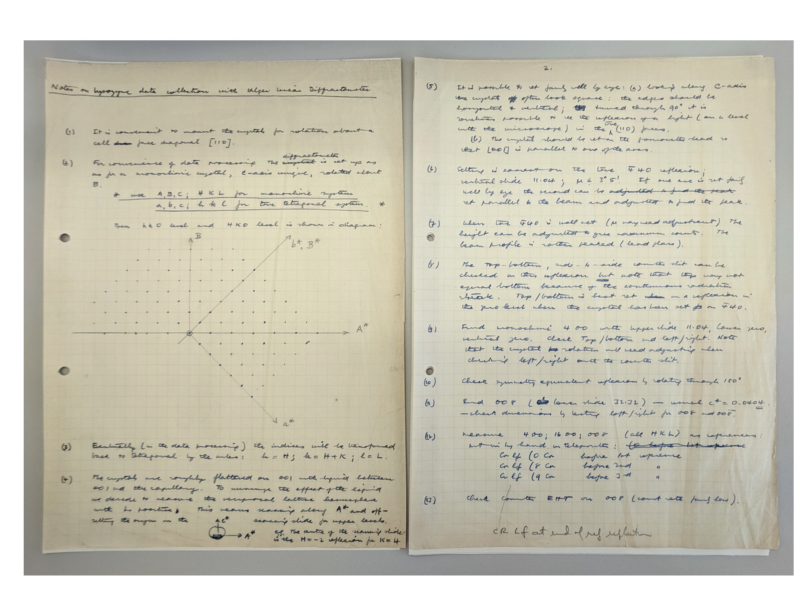 The results of the organizing and cataloguing can now be enjoyed by users for the Weston Library, the new home of Arturo and Ilsa Barea’s papers. The Bareas started their exile homeless, but also paperless and bookless. They managed to bring over a case with personal and family documents and some photographs from their previous life in Spain. But that’s about it. For the most part, this archive is an exile’s archive: written in exile, built in exile, read in exile and kept in exile until today. I have to confess that my weekly visits to the archive, working in the nostalgic living room furnished with Biedermeier cabinets, with walls full of books and magazines, blue china and netsuke that belonged to Ilsa, overlooked by the solemn presence of Barea’s grandfather clock, are still my favourite part of the research. Each letter or photograph has a story behind it and more often than not, Uli has filled in the blanks with her memories of Arturo and Ilsa. Arturo Barea (Badajoz 1897 – Faringdon, Oxfordshire 1957) was a Spanish writer, literary critic and broadcaster. A socialist and active member of the UGT (the Socialist trade union) during the Spanish Civil War, Barea was the head of the Press Department of the Republican Foreign Office in Madrid, dealing with foreign press correspondents such as Ernest Hemingway or John Dos Passos. During this time, he met and married his second wife, the Austrian socialist Ilsa Barea (née Ilse Pollak), his life-long companion, collaborator and translator. In 1938 Barea and Ilsa left Spain for France and then England, where they arrived in March 1939. It was during his early years in exile that Barea became a well-known contributor of articles and short stories to Horizon, Time and Tide, the New Statesman, the Times Literary Supplement and Tribune, aside from contributing the essay ‘Struggle for the Spanish Soul’ to Orwell’s wartime series Searchlight Books. He was also a regular broadcaster for the BBC Latin American Service under the penname ‘Juan de Castilla’. 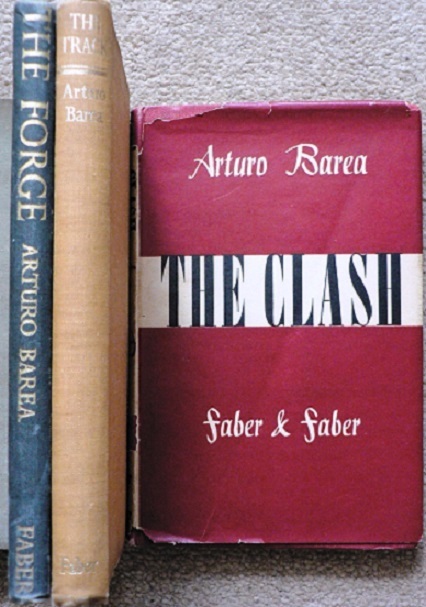 Barea is the author of the autobiographical trilogy The Forging of a Rebel, which was first published in English by Faber&Faber (1941-1946) and edited by T.S Eliot. The trilogy was an immediate international success and was translated into nine languages during the forties. The Spanish edition came out in Argentina in 1951 and it was only published in Spain in 1977 after Francisco Franco’s death. Barea never returned to Spain and became a British national in 1948. Ilsa Barea (1902-1973), née Pollak, was a socialist political activist, journalist and translator. Born in Vienna into a liberal family, Ilsa was politically active early on, particularly in the areas of propaganda and education. She was a member of the Austrian Communist Party initially then later the Austrian Social Democratic Party. In 1936, she was employed by the Press Department of the Republican Foreign office in Madrid. During this period of the Spanish Civil War, she met Arturo Barea. They were both working as censors at their headquarters in the Telefonica (the title of her serialised novel published in the Austrian Arbeiter-Zeitung in 1949). After the death of her first husband, Leopold Kulcsar, in January 1938, Ilsa married Arturo and together they fled Spain. While in exile, Ilsa continued supporting the Spanish Republican struggle by publishing articles in Time and Tide, New Statesman, Times Literary Supplement, and Tribune. In August 1939 she joined the BBC Monitoring Service in Evesham, translating broadcasts from German and Spanish alongside Ernest Gombrich, George Weidenfeld, Martin Esslin and Anatol Goldberg. She was an exceptionally gifted linguist. Later her work focused on evaluating foreign writers, translating many of them for English and American publishing houses. She also broadcast for the BBC on a number of subjects. Ilsa was a close collaborator of Arturo’s, influencing his work in many ways. Her most important contribution was the translation of his trilogy The Forging of a Rebel into English, praised for its quality in many reviews. The legacy of her father, Valentin Pollak, a well-known Viennese teacher and educationalist, was carried on in Ilsa’s work as a teacher herself and interpreter for Labour Parties and Unions across Europe. She became a British national in 1948, but after Arturo’s death in 1957, she returned to Vienna regularly, spending the last years of her life there. She is the author of Vienna: Legend and Reality (1966), a social and cultural history of the city. 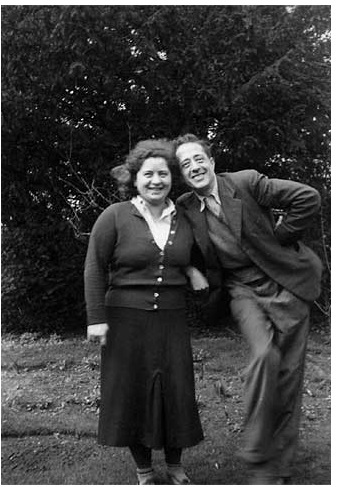 Arturo and Ilsa shared a life of letters until his death in 1957; he wrote; she wrote and translated what he had written in Spanish into English. Snooping around the couple’s papers I can imagine them in their cottage in Eaton Hastings, working at their shared desk piled with papers threatening to tip over while listening to the radio in the background and having endless discussions about politics in several languages as they shared the house with a mixture of family members and friends from different places. It is precisely this mixture of languages and intellectual traditions which has a very strong presence in the archive and the library. It is overall surprising to find a comparatively small proportion of material in Spanish – letters and documents in English, German, French, Danish and even Swedish open a window onto an important period of European history. The archive is an important repository of Spanish culture in exile, but also of Austrian culture and, even more importantly, of the internationalism that permeated the anti-fascist struggle of the Second World War and the anti-communist struggle during the Cold War. Some of the most important holdings in the archive are the original and annotated typescripts of Arturo and Ilsa’s work like Arturo’s La Raiz Rota, Ilsa’s Vienna, as well as their many short stories, articles and even unpublished poetry by Ilsa. Sadly there is no typescript of La forja de un rebelde, but only a few chapters in French and the first two pages of La forja in Spanish, probably from 1938. Arturo and Ilsa’s papers are hard to separate. Aside from their close intellectual collaboration, she often wrote letters on his behalf, particularly when they first arrived – many of them explaining Arturo’s limitations with English. But Arturo could read in English, and the number of British classics in their library gives credence to a biographical note of 1941 which explained “that his spoken English is still atrocious, but he is beginning to appreciate Jane Austen”. 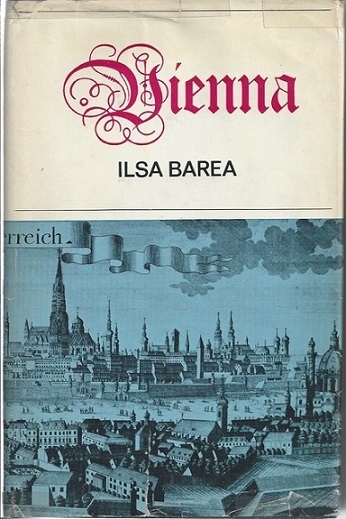 There is an incredible articulation of Spain and Britain in Barea’s work and in the archive and library. On the shelves we can find Don Quijote de la Mancha sitting quite comfortably next to Tristram Shandy. Letters to Cyril Connolly and John dos Passos are written in Spanish and are mixed with those of Arturo to his family back in Madrid. As expressed in one of Barea’s obituaries, he served as an “interpreter between two different civilizations and ways of life”. Uli tells us that the Bareas spent most of their time writing letters and reading newspapers and magazines, ranging from the Manchester Guardian to Picture Post. All of these activities have left traces in the archive as well. Apparently, one of Uli’s jobs was to help them read through the morning papers, to cut out all the news relating to whatever topic they were writing about at the moment and to paste the clippings in scrapbooks – all of which are also in the archive. Throughout their careers, Arturo and Ilsa wrote book reviews and articles about the literature and authors of their homelands. They also had an important role in promoting, and often translating into English, Spanish authors such as Camilo J. Cela and other writers in exile like Guillermo de Torre, Ramón J. Sender, Esteban Salazar Chapela, Francisco Ayala or Max Aub. After Arturo’s death, Ilsa continued this work as a translator from Spanish and German, but also as a reader for British publishing houses, as an editor, and as an interpreter, particularly for trade unions. We can find most of this paperwork in the archive, aside from around 12 boxes of correspondence that traces Arturo and Ilsa’s work and life in exile. The archive also illustrates Barea’s relationship with Latin America. Articles for the Argentinian newspaper La Nación, around 650 of the 850 broadcasts he wrote for the BBC Latin American Service, fan-mail to “Juan de Castilla” and details of his 1956 trip to Argentina, Chile and Uruguay – including airplane tickets and a record of all the vaccines he needed. Arturo’s past as a non-intellectual also sneaks into the archive in rather unexpected ways. One of his major projects was to design a bookshelf system that could be assembled and dismantled by anyone in order to adapt to different spaces and uses, decades before IKEA had the same idea. Drawing on his previous experience in a patent agency in Spain, Arturo tried to patent his design. The shelves still stand in Uli’s living room, more than 60 years after Arturo first built them. Today, the Bareas’ archive is arguably still in exile. The donation to the Bodleian is an important step in assuring access to its holdings for future generations of scholars – although researchers will now miss Uli and her partner Eugene’s wonderful meals and conversations. One question that comes to mind is why not send the holdings back to Spain, as has happened with other Spanish Republican exiles’ libraries? The return to Spain is often seen as a reconciliation following the injustice of the years of expulsion. Several reasons are behind the decision to donate the archive to the Bodleain. The cosmopolitanism of the holdings; the fact that Arturo’s work is difficult to separate from that of his wife, which represents a whole chapter of Austrian culture in exile; and the fact that the transnational character of their work might be best represented in Britain, as an example of the internationalism of the war and post-war periods. It is also a much needed reminder of how Britain’s (often reluctant) hosting of European exiles resulted in the political, cultural and social contributions of Europeans to British culture and politics. Most importantly, it is undeniable that Ilsa and Arturo started their exile struggling to overcome the violent loss of the life they were forced to leave behind. In 1956 Arturo still felt that ‘la patria se siente como un dolor agudo’ – the homeland feels like an acute pain. But Ilsa and Arturo were also able to embrace exile as a new beginning, a new life together in a foreign land that soon became home. Archives, libraries, books and scrapbooks can help exiles keep links with their homeland, but can also ground them to their new homes. Arturo and Ilsa’s archive is testimony to this. If, in Adorno’s words, “To those who no longer have a homeland, writing becomes home”, the archive is already home and it belongs here, in Britain more than there, in Spain. When material from the archive of Archibald Clark Kerr, Baron Inverchapel – or indeed from any of the Bodleian’s modern archives – is ordered to the Special Collections reading rooms, it will most likely arrive in a greyish blue box, the papers neatly housed in blueish grey folders of the same colour. Sheets of acid-free, calcium carbonate buffered paper to separate leaves, ‘Melinex’ polyester pockets for photographs, folder titles written in 2B pencil, acrylic adhesive labels, a brass paperclip here and there – everything screams (or rather whispers… it’s a library after all) ‘archival packaging’. BS 4971, the 2017 British Standard for the conservation and care of archive and library collections, is the Holy Grail, and no packaging material not complying with its strict rules shall ever come near our precious documents. Material from the Edgar Wind Papers in full archival packaging armour. Blue-grey or grey-blue, the colour of the envelopes and boxes is heavily contested. However, when archives first arrive at the Bodleian, the packaging is quite different: all kinds of boxes, cartons, baskets and trunks are used for transfer, and the papers are likely to still be in the order and condition their creator or collector stored them in – including a wide array of folders, envelopes, pockets, sheet protectors, paperclips, pins, staples, ribbons, cords and rubber bands once used to organize and protect them. 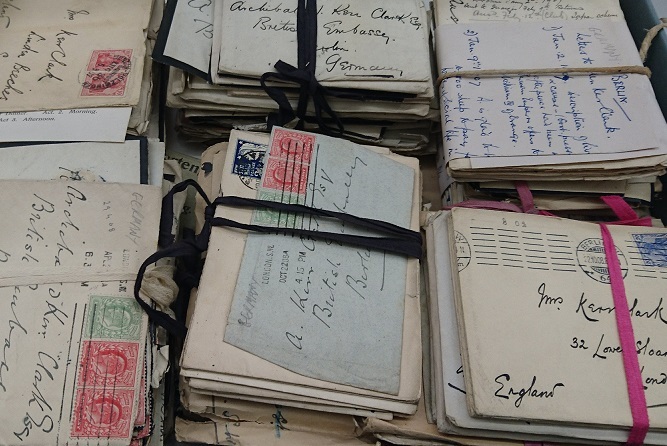 All bundled up: Letters from the Archive of Archibald Clark Kerr, Baron Inverchapel, c.1908. Why are they addressed to Archibald Kerr Clark – find out here. 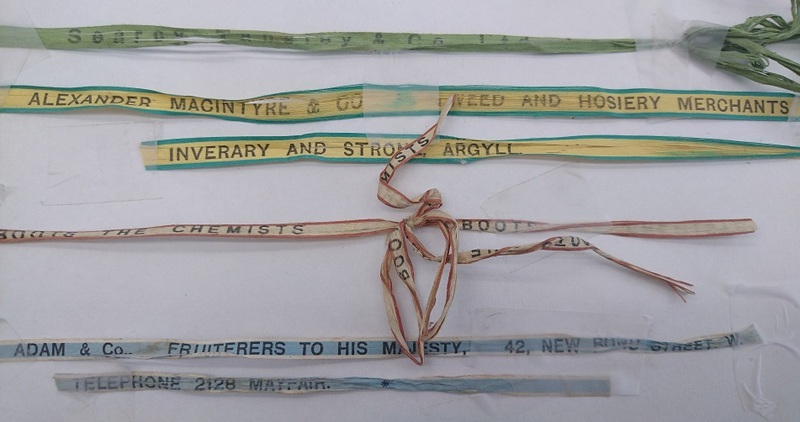 Whilst it was very helpful to identify runs of correspondence, and match letters with their envelopes, this organisation system had two big downsides: the letters would be difficult to access if researchers had to remove them from their envelopes first, and all the early 20th century silk, cotton, wool, hemp, jute… ribbons and cords are not very likely to be compliant with 21st century BS4971 specifications. Consequently, quite a lot of time on the Inverchapel cataloguing project was actually spent on pre-cataloguing archival processing tasks: removing all those strings, and the rusty pins and paperclips holding together sheets of paper inside the envelopes, unfolding pages, encasing photographs in Melinex, and not least placing the flattened papers safely in archive standard folders. 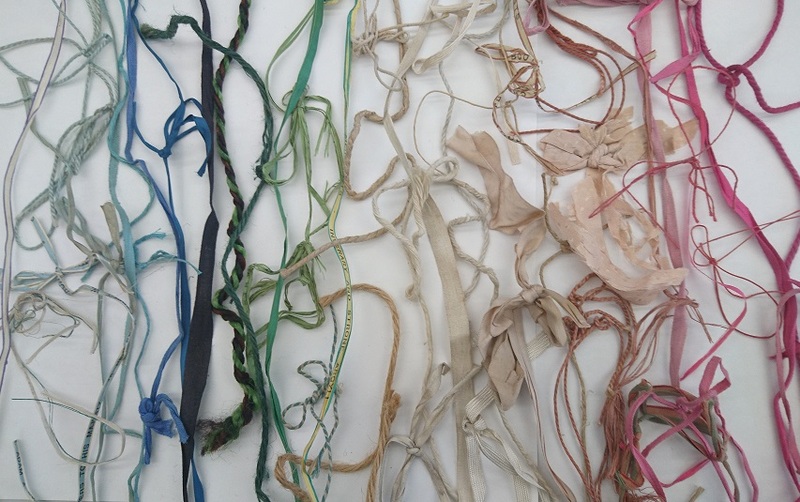 A rich bounty: Ribbons, cords and strings removed from the Inverchapel material. …We should have tied them all together and measured the result – in ells, obviously! ALEXANDER MACINTYRE & CO – TWEED AND HOSIERY MERCHANTS – INVERARY AND STRONE. ARGYLL. – Proud of his Scottish heritage, and owner of the Inverchapel Estate near Lock Eck, Clark Kerr would have known where to buy his tweeds! BOOTS THE CHEMISTS – how people carried home their soap and aspirin before plastic bags were invented. G. ADAM & CO., FRUITERERS TO HIS MAJESTY, 42, NEW BOND STREET, W., TELEPHONE 2128 MAYFAIR – only the best apples and pears! The closest an ambassador’s archive can get to a rainbow? 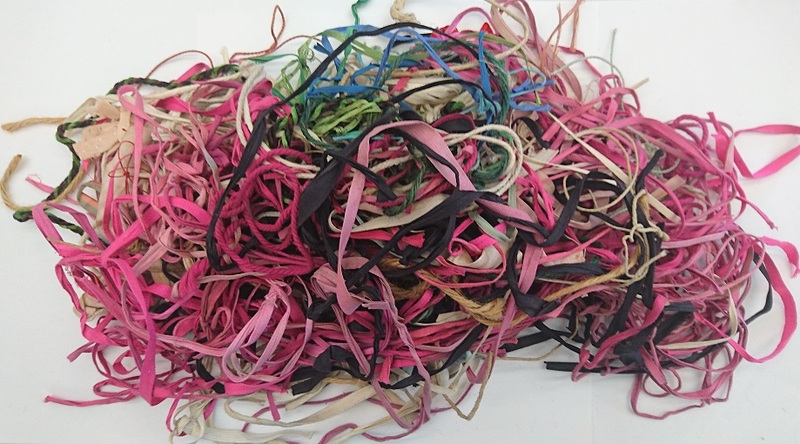 But however pretty and colourful those tapes and ribbons may be, they still face the fate and final destination of all* old fasteners which could potentially be harmful to our precious archives – the bin. 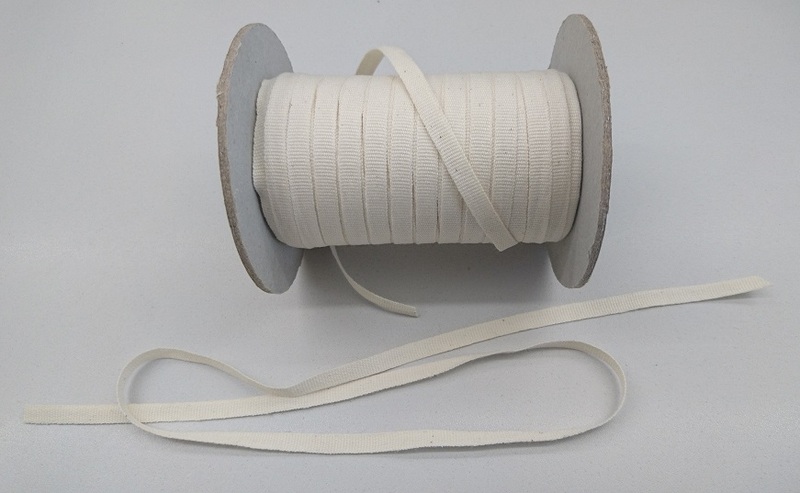 Where ties are needed to hold bundles together, there is now archive standard unbleached cotton tape in place. Admittedly, this is less exciting than its colourful historic cousins. But it goes very well with the blueish grey/ greyish blue of our acid-free, calcium carbonate buffered boxes and folders, and most importantly: it complies with BS 4971. Playing it safe: Unbleached cotton tape for archival use. help to determine the age of undated documents. The online catalogue of the Archive of Archibald Clark Kerr, Lord Inverchapel, is now available. Archibald John Kerr Clark was born 17 March 1882 near Sydney, Australia, the son of John Kerr Clark (1838-1910), a sheep station owner originally from Lanarkshire, Scotland, and his wife Kate Louisa (1846-1926), daughter of Sir John Robertson, prime minister of New South Wales. In 1889, the family moved to England, though John Kerr Clark later returned to Australia. Kerr Clark was educated at Bath College, and in France, Germany, Spain and Italy, where he studied languages. 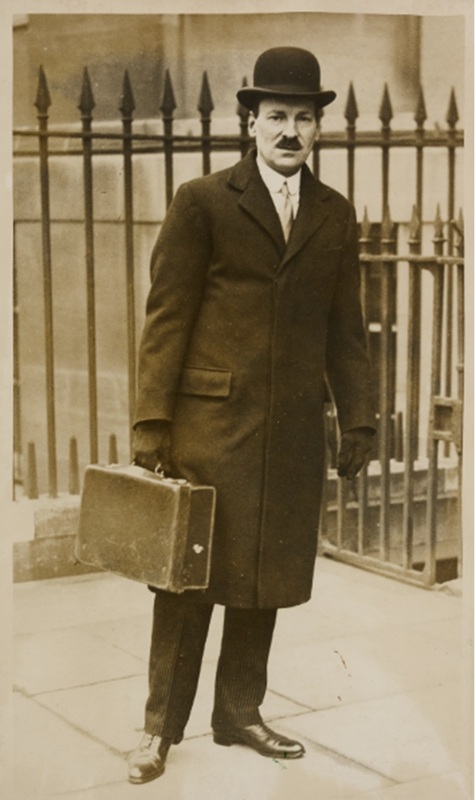 In March 1906 he passed the entrance examination for the diplomatic service and started working at the Foreign Office in London. After adopting Kerr as an additional surname in 1911, he became known as Archibald (or Archie, to his friends and colleagues) Clark Kerr. His first posting as a young diplomat took him to Berlin (1908-1910), and after postings to Buenos Aires (1910-1911), Washington (1911-1914), Tehran (1914-1916) and Tangier (1919-1922), he became deputy to High Commissioner Lord Allenby in Egypt (1922-1925). He served as Minister of the United Kingdom to Guatemala, Honduras, Nicaragua and El Salvador from 1925 to 1928, to Chile from 1928 to 1931, and to Sweden from 1931 to 1934, before he was appointed Ambassador and posted to Iraq in 1935. Clark Kerr was British Ambassador to China from 1938 to 1942, during the Second Sino-Japanese War. As Ambassador to the Soviet Union from 1942 to 1946, he was key to shaping the Anglo-Russian relations during the Second World War – most famously, by convincing Churchill to return to talks with Stalin during their meeting in Moscow in August 1942. A senior British Diplomat, he attended many of the Allied wartime conferences, including the ‘Big Three’ conferences in Teheran, Yalta and Potsdam. He worked with the Allied Commission to Romania in 1945/46, and in Spring 1946 was sent on a special mission to Java as a mediator in the tensions between the Dutch government and the Indonesian nationalists. 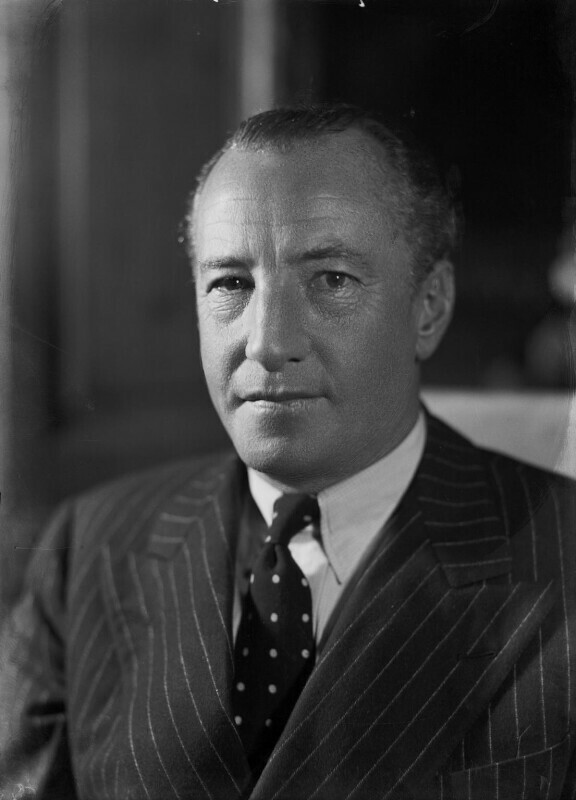 From 1946 Clark Kerr, now elevated to Peerage as Baron Inverchapel, served as British Ambassador in Washington. In March 1948, he retired from the diplomatic service, but was almost immediately appointed to the new committee on European unity, for which he worked until 1949. He died at Greenock 5 July 1951, and was buried at the Inverchapel Estate near Loch Eck in Scotland. 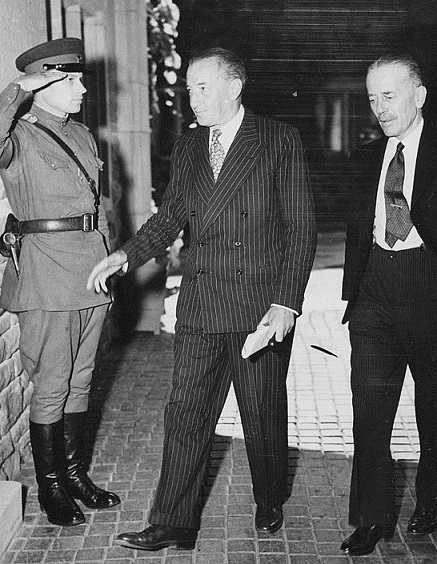 Archibald Clark Kerr entering the Cecilienhof Palace on the third day of the Potsdam Conference, July 1945. (On the left Sir Alexander Cadogan, Under Secretary at the British Foreign Office). Clark Kerr’s archive comprises his personal papers and correspondence, alongside material relating to his career as a diplomat, from the 1900s to the 1940s. Family papers and correspondence, dating back to the 1850s, document the family history, his parents’ lives in Australia, and Clark Kerr’s connections to family members, especially his close relationships to his mother and to his sister Muriel. Often, the private and the public overlap: for example, in the many letters exchanged between Clark Kerr and his mother. They corresponded at least twice a week, sometimes daily, and together with personal and family news, they exchanged newspaper clippings and extensively commented on society, culture, politics and international relations in the 1900s, 1910s and early 1920s. Similarly, Clark Kerr’s correspondence with colleagues and friends, such as Harold Nicolson, Vita Sackville-West, Eustace Percy, Alice Drummond-Hay, Robert Boothby and Gerald Villiers, and with British and foreign aristocrats, such as the German Kaiser’s sister, Sophie Duchess of Sparta (later Queen Consort of Constantine I of Greece) and Elizabeth Bowes-Lyon (later Queen Consort of Georg VI and Queen Mother), paints a vivid picture not only of personal contacts and relationships, but also of the times and social circles the correspondents were living in. 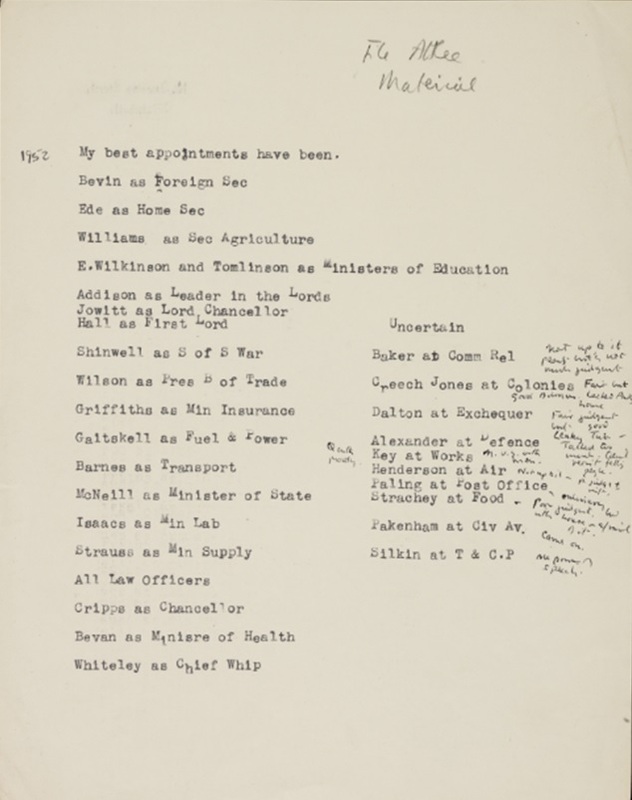 Also available is the online catalogue of the working papers of Clark Kerr’s biographer Donald Gillies, who published Radical Diplomat: The Life of Sir Archibald Clark Kerr, Lord Inverchapel, 1882-1951 in 1998.